Active adults looking for an active oasis in Georgia will love Village at Deaton Creek. 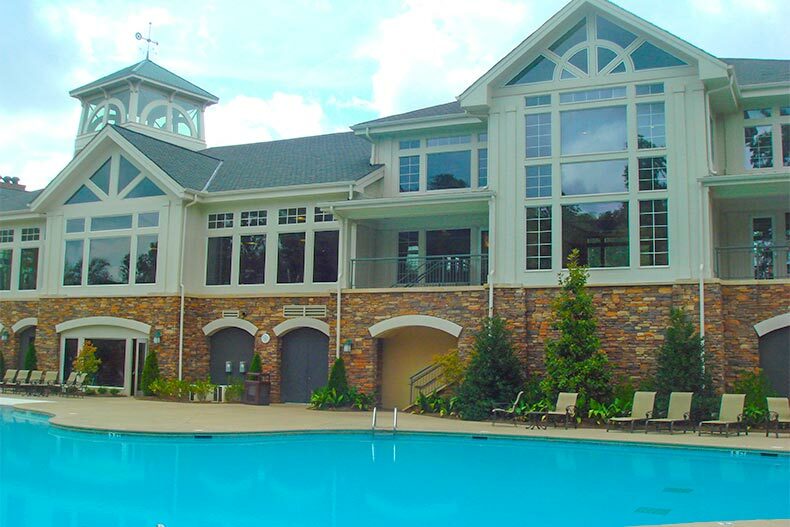 Located 40 miles north of Atlanta in Hoschton, Georgia, Del Webb’s Village at Deaton Creek is a gated active adult community far enough away from the thriving city of Atlanta to not have to worry about traffic but close enough to visit anytime you want. With 1,144 homes in the community, the Village at Deaton Creek offers several housing options for buyers. Homes for sale are available on a resale-only basis, ranging in price from the low $400s to the mid $500s. A wide variety of home styles are scattered throughout the community with 14 floor plans, including two villas and 13 single-family homes. The single-family homes range in size from 1,244 to 2,587 square feet and include a minimum of two bedrooms, two baths, and a two-car garage. There are two villa floor plans that are 1,217 and 1,393 square feet, with two bedrooms, two baths, and a two-car garage. When it comes to amenities, a 35,000 square-foot, two-story clubhouse called the Club at Deaton Creek, is the epicenter of the community. It includes an 8,000 square-foot, state-of-the-art fitness center, an aerobics and dance studio, a grand ballroom, indoor lap pool with spa, a library, a demonstration kitchen, and several hobby and craft studios. Outside of the clubhouse is an outdoor resort-style pool with beach entry, a softball field and numerous sport courts, including pickleball, tennis, croquet, horseshoes, and bocce ball courts. There’s also a dog park and community garden, as well as numerous neighborhood parks and nature preserves, with miles of scenic walking and biking trails. Worried about home maintenance? There’s no need, as the homeowners’ association provides lawn and common area maintenance, as well as access to garbage pickup, community internet and the 25/7 guard gate house. Plenty of classes and clubs are offered to residents, ranging from art and bible study to movies and model trains. Ever wanted to take a Zumba class, learn a foreign language, learn tai chi or learn to wood carve? All of these areas of interest are available, and so many more. Though there’s an array of activities always going on at the Village at Deaton Creek, there’s also plenty of cultural, retail, and entertainment options in the area as well. The Mall of Georgia, which has more than 200 stores, is just two exits down from the community. And right outside the gates of the Village at Deaton Creek are everyday shopping conveniences such as a grocery store, a pharmacy, coffee shops, and restaurants. And just 45 minutes away in Atlanta is the Georgia Aquarium, Emory University, the Margaret MItchell House, the Fox Theater, and tons of other destinations are just waiting to be explored.